Vimeo is a fast growing video platform that is being used by a lot of upcoming artists and designers these days. If you are in urge of learning some ways of how to trim videos and cut videos for Vimeo, then here are some ways to do so! This is a tutorial on how to trim and cut Vimeo videos. If you want to record high paced online gameplays, consider Wondershare Filmora scrn which is a powerful but easy-to-use screen recorder & video editor. Some of its main features include recording high paced games at up to 120 fps, recording screen and webcam simultaneously. Apart from that it's also a handy video editor tool, with which you will be able to do basic editing, add annotations/text/callouts and more. Download the free trial version below. Wondershare Filmora is a professional application which helps you in trimming and cutting videos. Through the feature of timeline editing, you can remove any parts of the video that you don’t want to utilize and simply keep the ones that you wish to. 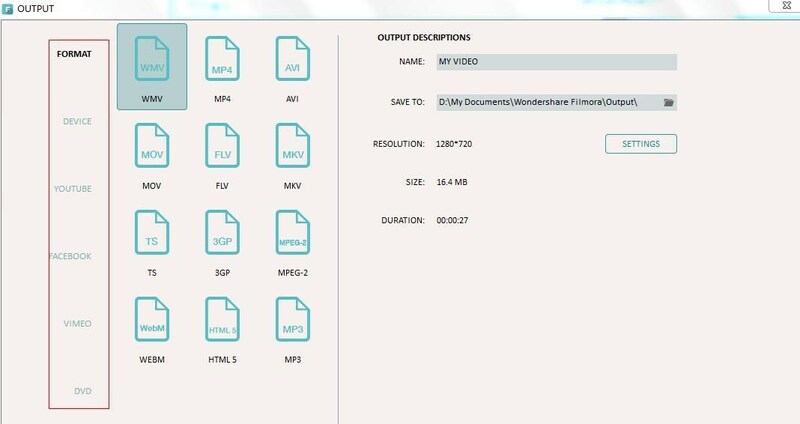 Download video editor Wondershare Filmora below now. Click "Import" on the primary windows and select video files from your computer, or simply drag and drop files to the User's Albums before adding them to the Timeline for trimming. Now you have to trim the videos in the timeline area. The unwanted parts are usually at the beginning or ends of the videos. You simply need to hang the mouse at the corner of your video clip until the trim icon pops up. You just need to drag the icon forward or backward to trim the parts that you don’t want. If the video that you don’t want is in the midst of all the important scenes, you need to click the scissor icon to split the video and then delete the part that you want to. Once you are done, you now have to export or save the video according to the format that suits your utilization. If you want to have an online solution, Filmora video trimmer is a free online tool that can help you trim video instantly. You can upload your video from computer and video link with drag-and-drop. It is easy to use with the slider or just input specific start and end times for precise trim. More importantly, the exported video is free of watermark. It is definitely worth a try! Click Filmora video trimmer. Import video by dragging or clicking. After importing video, an editing interface will come. Here, you can trim a small part that you want to keep by dragging or input times. After your get what you want, click Done below. A few seconds later, the trimmed video is ready. Now, download and share it to social media right away! Video Cutter is an online free video trimmer and cutter. It is extremely user friendly too. Here are the steps for trimming the Vimeo videos. Open up Video Cutter and click “Open file” button to upload the video you want to trim. Once you choose the file, the video trimmers starts working and creating thumbs of the videos. Now to begin cutting, you need to drop the left button of the left track bar and then drop the right button of the right track bar to end the cutting position. The video is trimmed as simple and fast as this. You can now choose the format in which you want to save the video and save it on your PC. Once the Free Video Cutter has been installed in your PC, open the video file of your choice. Now simply drop the left button of the Left Track Bar to begin the cutting position and drop the right button of the right Track Bar to end the cutting. Make sure that the start trimming position is smaller than the ending one. Choose the format in which you wish to save the video and save it wherever you want to. Open the video file in the application. With the help of the timeline scrubber, you can easily drag it to the point where you need to start cutting the video from and drop it there. Another scrubber will appear and you will drag it until the part that you do not want is trimmed. Once the video is trimmed, you can export it and save it wherever you want to. All the formats are compatible with Apple devices. Video making is now a huge business online which we refer to as vlogging. If you are looking for an application which can easily help you trim video or cut video for Vimeo, then you can try these major video trimmer applications. They are super easy to use and don’t take much of your time either. Stop wasting time or taking long ways to trim down the videos. Utilize the applications that have been created for you by the experts so that you can save your time and invent the best videos at the same time!